A big thank you to Curate Snacks for sponsoring this post. As always, all opinions expressed here are my own. Thank you for supporting the brands and companies that help make Pumpkin ‘N Spice possible! 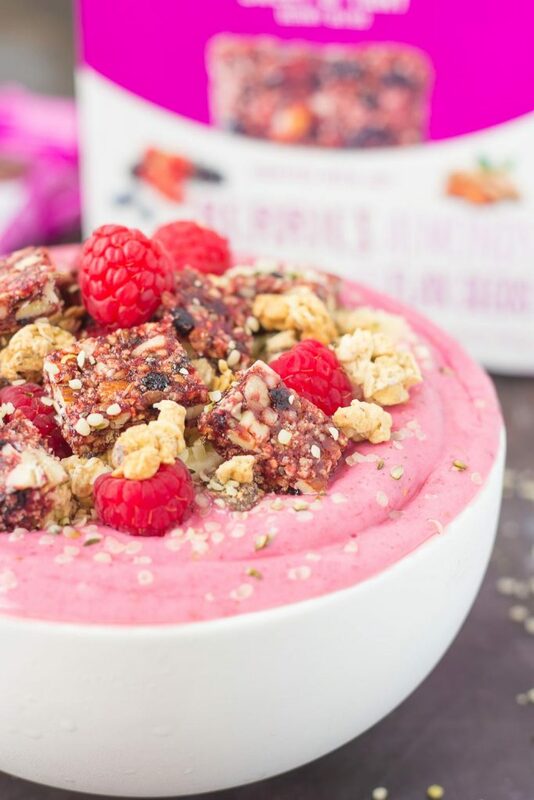 This Raspberry Almond Butter Smoothie Bowl is a delicious way to start your mornings off right. 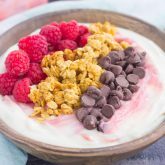 Packed with sweet raspberries, Greek yogurt, and almond butter, this bowl is bursting with flavor and just the right amount nutritious ingredients. Top this dish with a Curate Bar, granola, fruit, and more for a healthy breakfast or mid-morning snack! A few months ago, I attended the Everything Food Conference in Salt Lake City. I was fortunate enough to be able to plan the trip with some of my favorite blogging friends. After talking every day for the past two years, we were able to coordinate our schedules so that we could all finally meet, hang out together, and learn lots more about food blogging. This was my third food blogging conference that I’ve attended, and definitely the best one so far. I heard from some amazing speakers, learned more about different aspects of blogging, and got to talk to bloggers who truly understand the ins and outs of what goes into a food blog. And, of course, there was food! Since this conference was geared specifically towards food bloggers, you can be sure that we were fed well. In between each session, they also offered a variety of healthier snacks and drinks to keep us energized. And my favorite snack was Curate Bars. Have you tried them? I couldn’t believe that I hadn’t heard of them before the conference, because after I tried their delicious bars, I was hooked. And I mean hooked! The crunchy texture, the irresistible flavor, and the good-for-you ingredients….that’s what I look for in any kind of snack bar. Curate Bars are filled with protein, plant-based fiber, and are gluten-free and non GMO. With tasty ingredients, such as quinoa, almond butter, chia seeds, chocolate, and pistachios, you can be sure that you are eating a snack that will fuel you all day long. So when I had the opportunity to try a variety of flavors, I was in snack bar heaven. With six varieties to choose from, it’s guaranteed that you’ll find a favorite (or three)! My personal favorites are the Salted Decadence Bar, which contains dark chocolate and almonds, the Sweet & Tart Bar, which contains berries and almonds, and the Irresistible Dark Chocolate bar, filled with strawberries and pistachios. But, Curate Bars aren’t just for snacking! Since I love creating unique recipes, I decided to add this snack to one of my favorite breakfast dishes, a smoothie bowl! If you’ve been hanging around here long enough, you know I’m all about the simple recipes. Especially for breakfast…I often go with my standard cup of coffee and yogurt, when I know I should switch up my routine more. 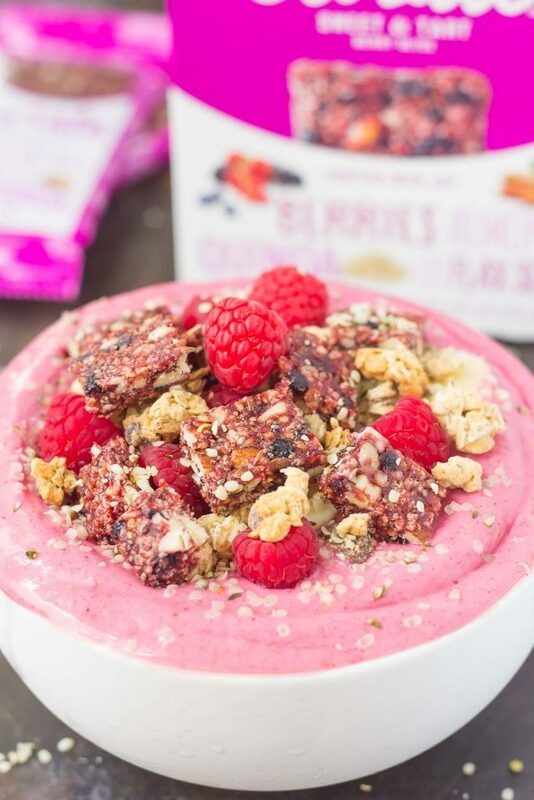 And this Raspberry Almond Butter Smoothie Bowl couldn’t get much easier, or more delicious. The best thing that I love about smoothie bowls (besides the decadent taste) is that it’s so easy to customize, depending on your preferences. I’ve made this chocolate peanut butter version, and this banana kiwi green version, and both are my favorites because of the unique taste. With this bowl, I love the combination of raspberries and almond butter. The two pair perfectly together and create a deliciously sweet taste. 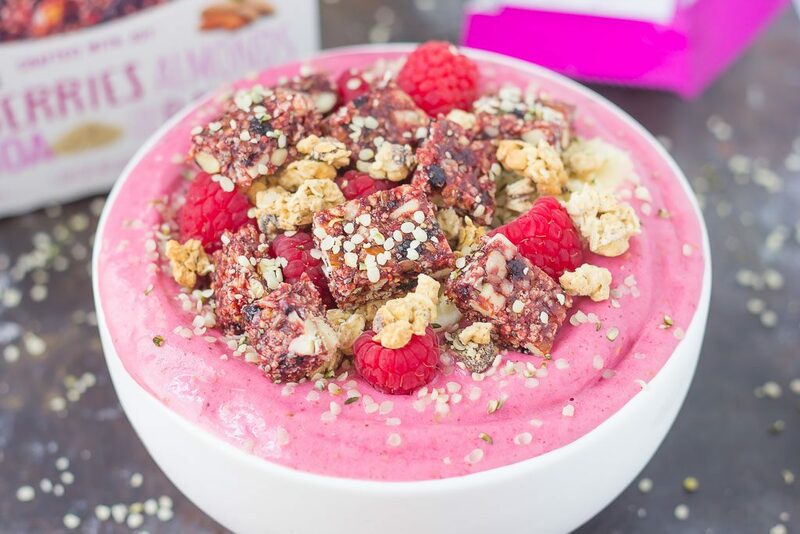 This Raspberry Almond Butter Smoothie Bowl is packed with frozen raspberries, a frozen banana, almond milk, and almond butter. Give it a whirl in the blender and be prepared to be amazed at the gorgeous color and sweet taste. And now comes the fun part…the toppings! Since I’m now an official Curate Bar lover, I knew my favorite snack would work perfectly as a topping for this smoothie bowl. I used the Sweet & Tart Berry Bliss Bar, cut into chunks, to sprinkle on top of the bowl. I then added in some fresh raspberries, blueberries, granola, and hemp seeds. Perfection in a bowl, right? 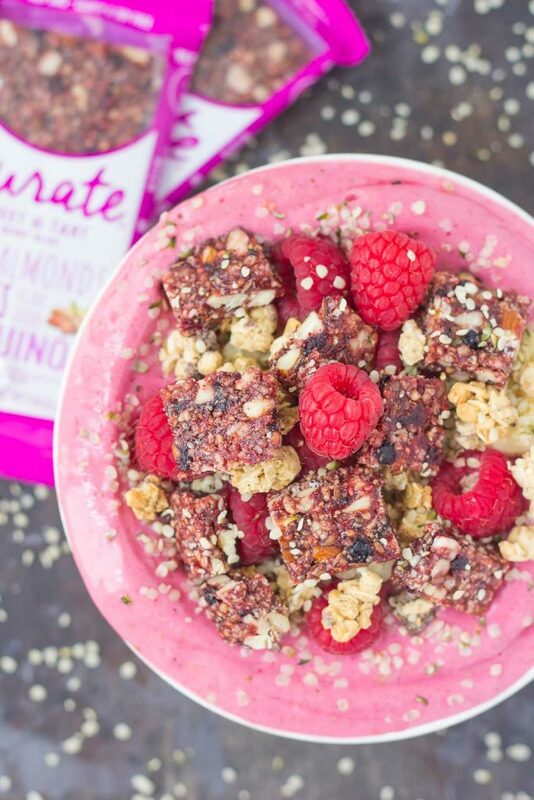 So the next time you’re looking to jazz up your breakfast, grab your favorite Curate Bar, some fruit, and whip up this tasty Raspberry Almond Butter Smoothie Bowl! In the canister of a blender, combine the raspberries, banana, Greek yogurt, almond milk, and almond butter. Pour into a bowl and top with Sweet & Tart Berry Bliss Curate Bar, raspberries, blueberries, granola, hemp seeds, or any of your favorite fruits or nuts. Sounds like you had the best time! 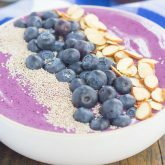 And we all win, because I had never heard of Curate bars before, and clearly I need to try them, with this scrumptious smoothie bowl recipe! Sounds like they gave you the good snacks at the conference! The one with salt and chocolate has me wanting to try them, too. And this bowl is so pretty! Thanks for the smoothie love, Mir! What a fun time! Must have been so nice to get together with fellow food blogger friends and, of course, great food doesn't hurt, either :) I love easy, healthy breakfasts like this. I've never heard of this brand before, but I know I would love the salty/sweet one. This bowl is such a pretty colour too! Aren't smoothie bowls the best?! Thanks for the kind words, Sarah! Thank you, Medha! I'm officially hooked on almond butter! This is one inviting breakfast! Love the crunch, the color and the flavor combination!! I would love to attend a blogger conference...definitely on the to-do-list! How awesome it must be to connect, in person, with folks you communicate with on a regular basis! Love it! Thanks for the sweet comment, Annie! You just can't beat a healthier flavor combination like this! I love smoothie bowls because you can pile on the fixin's! The color of this smoothie is so pretty, and I just love the toppings. I definitely need to try those Curate snacks -- they look delicious! This smoothie bowl is so so pretty, Gayle! 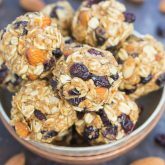 Love the almond butter in here and that you topped them with the Curate bars! Such a fresh and delicious breakfast! Thanks, Kelly! The Curate bars and almond butter make this bowl extra delicious! It was a lot of fun! Definitely need to meet so many bloggers and talk to people who actually understand what I do! :) Thanks for the kind words and pin, friend! I saw your pic on IG of the EFC, looks like ya'll had a blast! I'm jealous! I have yet to attend a conference, but it IS on my list!! Hopefully one of these days we will get to meet in person!! I'd totally love that! Anyways, I've never heard of Curate bars, but if you think they rock I know they gotta be delish! I'll have to be on the look out for them at the store! These smoothie bowls are GORGEOUS, Gayle! And you packed them with so much healthy deliciousness! Raspberries, Bananas, Greek yogurt, and almond butter, topped with curate bars, berries and granola? Breakfast perfection! Pinned of course! Cheers, lady! You must try a smoothie bowl...you'll be hooked in no time! Plus, it more fun to eat it with a spoon! :) And yes, can't wait to see everyone again! Thanks for the kind words, friend! They're SO good! :) Thanks, Blair! Yum, the smoothie bowl looks gorgeous! and you are right, the conference was really wonderful :) It was so good to finally meet all of you! I'm glad you had a great time at the food conference. 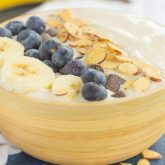 Wish I was closer to attend such a events ;) These smoothie bowl looks just amazing Gayle :) It's healthy and wholesome, perfect for breakfast. Pinning of course. Have a great weekend Gayle. Thank you for the smoothie bowl love and pin, Natalie! I think it is pretty much a guarantee that any day that starts like this will be great. I completely agree! :) Thank you! Sounds like you had great time at the conference Gayle! Wish I had this bowl in front of me right now! Definitely trying these snacks! Ooh, what a pretty shade of pink! I have yet to try a smoothie bowl, but it's on my list! I love that you topped it with the Curate Bar! Such a perfect way to start the day! Smoothies bowl are my favorite! I love adding all the different toppings for texture and crunch! This one looks so tasty and I love that you put the Curate Bar on top, so fun and creative! This looks absolutely stunning Gayle! We love smoothie bowls, mainly because you can pile them high with all this kind of deliciousness! Thank you for the smoothie bowl love, Dannii! This smoothie bowl looks delish! That food blogger conference sounds awesome! I've always wanted to go but haven't been making enough yet to send me. I'm just really holding out for one in the DC metro area so I can go! This is a beautiful smoothie bowl. The vibrant pink from the raspberries is fantastic! And I could pretty much eat almond butter off a spoon for dinner if I didn't control myself. ???? I could eat the entire jar of almond butter too! Thanks, Amanda!